While I know this can't work for everyone (or could it possibly?) -- I solved the skin issues I had on and off for the past 10 years and wanted to share. I solved the issues with oil. Yes, oil on my face. My already-oily-face loved it. At first I was just using grapeseed or coconut oil on my hands instead of lotion because the alcohol in lotions ultimately dried my skin out which meant that I always needed more more more. I loved infusing the oils with rose and mugwort to balance and restore my often stressed nervous system. Eventually I got bold and tried the oil on my face just to see how it felt. I did have to wipe off some extra but my skin looked and felt great. Soon my skin even stopped getting greasy because it wasn't over producing oil to make up for being over-dried out by conventional face wash. I've since started using the infused oil instead of store bought moisturizer or even face wash (though once or twice a week I still use the powdered gentle face wash to mix things up and get the tiniest bit of exfoliation). And sometimes I'll mix 1 part sugar to 3 parts oil for an effective facial scrub. If you want to make your own infused oil use a light one appropriate for cosmetic use like almond, jojoba, or grapeseed. Coconut oil is great too but it solidifies under 76 degrees. You can infuse with an herb that smells great, like lavender, or promotes skin health, like calendula. To do this, fill a jar halfway with the dried herbs, fill it the rest of the way with oil and place it in a sunny spot. Give the jar a shake every day and within about a month it should be ready to strain and use. Honestly, I'm more of a forager than a gardener. I love hiking and foraging allows for a serene walking meditation that I've always really enjoyed. That said, I am my mother's daughter and my mother is an epic gardener. I do enjoy the work and can never leave her house in the spring or summer without at least one new plant from her in tow. While I have over a dozen herbs in my garden this year this year, these three are my favorite to grow and use. Bee balm. Also known as oswego tea, wild bergamot, or monarda. Because this herb is not easy to find dried, attracts both bees and butterflies, and grows easily in all kinds of conditions, it's one I always recommend for a garden. The firework flowers open mid to late summer and can be added to salads or teas along with the leaves. It supports digestion, is relaxing, has volatile oils that can help stave off infection, and tastes great. While not at all minty, it is a type of mint and will spread. Lemon balm. Another herbalist described this one to me as "sunshine in a cup," and it is. It both tastes summery and brightens up a low or dark mood. It can help relieve tension, especially a tense stomach, making it great for digestion. I'll often munch on in it in the garden or pick some and add then to a cup of hot water for a quick tea fix. Also a mint, this one can take over a garden if left unchecked. Dill. The ultimate summer herb (although... ooh, basil...). I put dill on almost everything I eat in the summer It too is wonderful for indigestion. The leafy parts or seeds can be chewed or made into a tea to also help with bad breath! Once the excitement and buzz of the holidays are over, and we realize that we’re (at least!) three months from spring, it can be hard to follow through on our new year’s resolutions. Incorporating one or a few of these five herbs into your daily routine can help protect against the winter blues that keep you from feeling motivated to follow through with your goals. This is a delightfully summery type of mint, with a citrusy taste. It can help soothe anxiety, tension, and mild depression, and its uplifting nature can balance seasonal affective disorder. It helps with digestion as well, especially when related to stress. It’s also appropriate for children. Lemon balm is lovely steeped in hot water by itself or with other herbs. Bonus: because it’s a mint, it’s incredibly easy to grow in a pot yourself. Think about how your body relaxes when you deeply inhale an especially aromatic rose. A heart-opening herb, Rose helps with anxiety and feelings of depression or grief. It can be added to a tea or infused into an incredible-smelling body oil. Make sure that you are getting your herbs from a good source, such as Boline Apothecary in Clintonville or mountainroseherbs.com, because this is not the same type of rose that you find at the florist. While it is a tasty, relaxing, tension-relieving herb for humans, this is indeed the same herb that is a stimulant for cats. However, the pet store stuff is of the lowest quality, little more than green dust. High quality catnip, also an easy-to-grow mint, tastes great in a tea and blends well with lemon balm. And, like lemon balm, it also helps stomach aches and is safe for children. When taken regularly, this Ayurvedic (an ancient Indian system of healing) herb can rejuvenate the body and help it recover from symptoms of stress and fatigue. It can also aid in normalizing cortisol levels and irregular sleep patterns caused by stress. While the previous herbs act directly on the nervous system, ashwaganda changes the body’s response to stress by regulating hormones. This is often taken as a tincture in a dropper bottle and can be found at health food stores. A well-loved Ayurvedic herb, Holy Basil balances hormones, aiding the body with the effects of stress when taken regularly over time. It’s easy to grow and delightfully tasty. A good way to “take” holy basil is to grab a leaf to chew or drink it in a tea. I’ve recently given up drinking water, turning instead to herbal infusions all day, every day. Hot, cold, cool, warm, or sometimes as a popsicle. The infusions I make as an apprenticing herbalist are delicious and nutrient-rich, providing support for different body systems. I might drink an infusion with peppermint thrown in to ease a stomach ache, rosemary to ward off a headache, vitex to regulate my cycle, or rose and lavender to relax. I especially love making infusions of plants I find growing wild in my yard like red clover, yarrow, dandelion, or bee balm. When I make an herbal infusion I generally use about 1 - 2 tsp of fresh picked or high-quality dry herb for every 1 cup of water. I make sure to let the herb steep for 5 - 10 minutes, covered to retain the beneficial volatile oils, in just- boiled water. In the summer I like to make a super-concentrated cup and mix it with cold water in a giant jar to keep in the fridge for several days. 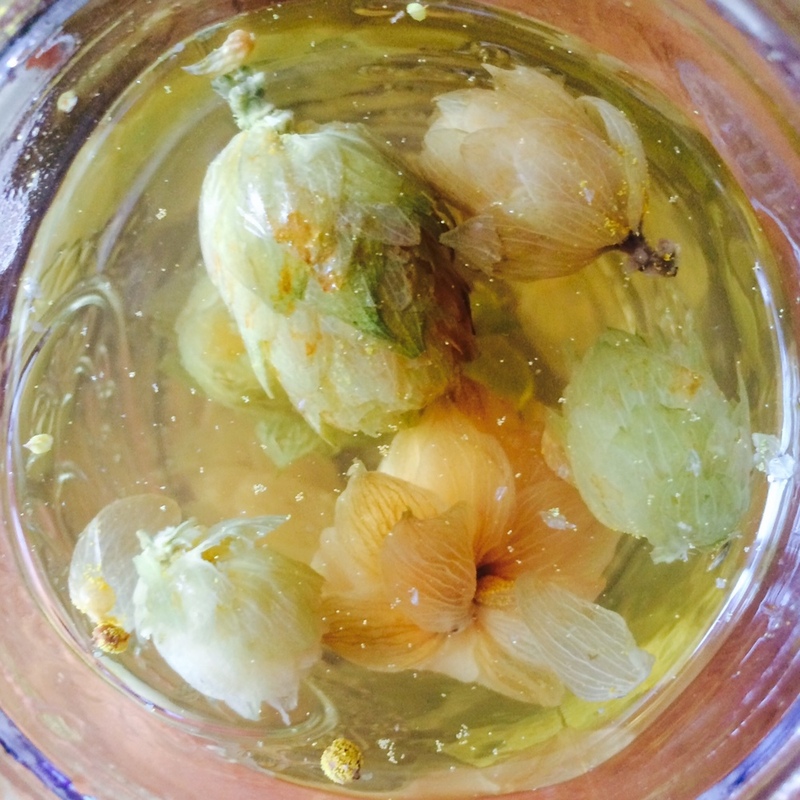 I’ve shared some of my favorite recipes for summer infusions below. While I listed the medicinal benefits of each, they can all just be enjoyed for flavor. Enjoy them hot or cold. REFRESH: Salad burnet (½ part) and Mint (1 part)-- Fresh and cooling. Helps with stomach aches. Salad Burnet is an easy-to-grow garden herbs that’s wonderfully cucumber-y (you can also use cucumber if you can’t find salad burnet). Mint of all types (but especially peppermint) help stomach aches. ZESTY: Hibiscus (1 part), Stevia (½ part), and Ginger (1 part)-- Tart, spicy, sweet, stimulating. Helps nausea, cramps. Hibiscus is high in vitamin C and surprisingly tart. Stevia adds sweetness. Ginger is the powerful plant in this recipe, providing nausea relief and stimulating circulation. CITRUS: Lemon balm (1 part) and Bee Balm (½ part)-- Fruity, aromatic. Helps stomach aches and promotes relaxation. Lemon balm is both a balm for anxiety and stomach ache. Bee balm (one of my favorite summer herbs and reminiscent of Bergamot, the major flavor of Earl Grey) eases all kinds of digestive problems. I’d be remiss not to mention something I’ve learned while studying herbal infusions that many find surprising. According to Traditional Chinese Medicine drinking cold water disrupts the harmony of the body. It cools the digestive system, slowing it down, and forces the body to do work to maintain its temperature, which ultimately makes you warmer. Drinking hot water, on the other hand, will make you sweat-- ultimately cooling. I personally drink a lot of my infusions at room temperature. Of course, a cool drink in summer just feels really lovely sometimes! watering my garden. you can see the flash of Monarda didyma on the bottom left. If you were to look out the back window of my mother’s house you would see that her flower gardens are endless, claiming territory in the grass and fading back into the forest that surrounds the house. It’s unclear where her garden ends and the native wildflowers begin, particularly because because of the native bee balm (botanical name Monarda) that grows in shocks of red and pink and lavender beyond her reach. While bee balm flowers are spectacular with their fireworks of color, It’s the intoxicating fragrance and history as a medicinal flower that excite me most. Many Native American tribes drank a tea made of Monarda didyma (also known as Oswego tea) to break fevers and aid digestion, and used the leaves externally as an antiseptic. White settlers gave another type of bee balm, Monarda fistulosa, the moniker Wild Bergamot after noticing its lovely citrus-y flavor and smell. One of my favorite summer drinks is a tea made from Monarda fistulosa flowers and leaves mixed with traditional tea leaves, a homemade Earl Grey. If you examine a Monarda plant closely, you’d find it has a square stem, characteristic of plants in the mint family. Any above-ground portion of the plant can be used in a tea, though I’m partial to the color and magic that using flowers brings to any tea or medicine. I have found that they do well regardless of whether they’re growing in full sun or in the forest, so no excuse if your garden has been too shady for flowers in the past. The flowers also have the distinction of driving bees mad with pleasure. Plant Monarda to draw and excite the butterflies and bees you want pollinating your garden. Determine which species are native to your area and plant them to become a true steward of the land.